Come in for a Unique Shopping Experience! 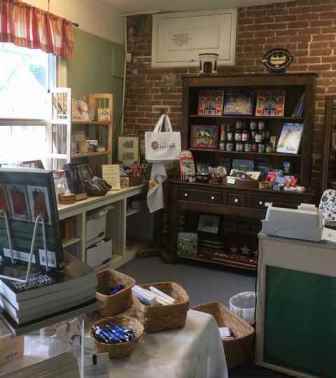 Our museum shop, located in the Beall-Dawson Museum in historic Rockville, is stocked with books on Montgomery County and Maryland history along with many other gift items. For that perfect gift, stop by and check out our selections – your purchases help support Montgomery History! An extensive selection of books on the history of Montgomery County. A wide range of books relating to Maryland, the Civil War, African American history, and Washington, D.C. Books on the topics of historic preservation, genealogy, architecture, textiles and collectibles are also available. Unique gifts for adults and children including jewelry, decorative objects, toys, paper dolls, holiday & seasonal gifts, greeting cards, note cards and much more. For a selected list of books available in the shop browse our book list. If we are out of one of the titles in our shop we would be happy to order it for you! The Montgomery County Story is also available for purchase in our shops and by mail order. The Montgomery County Story is a biannual journal published by Montgomery History. Topics range from sketches of county neighborhoods to biographical pieces to tales of Civil War battles. For current and past issues, please see this complete index of Issues of The Montgomery County Story, 1957-2017, with topical summaries. Copies of back issues of the Montgomery County Story may be purchased in the Museum Shop, or ordered by phone, mail or email. Issues dated prior to 2010 are $3 per issue. Starting in fall 2010, issues are $5 each (double sized). Shipping is $1.50 for the first issue plus .50 for each additional issue in the same order. Error: Error validating access token: Session has expired on Saturday, 19-Jan-19 08:33:19 PST. The current time is Tuesday, 23-Apr-19 11:44:54 PDT.